Why this blog? For many years people have told me my strengths are: (i) making accurate predictions on social and economic issues long before others (ii) offering practical solutions to complex problems (iii) teaching effectively. 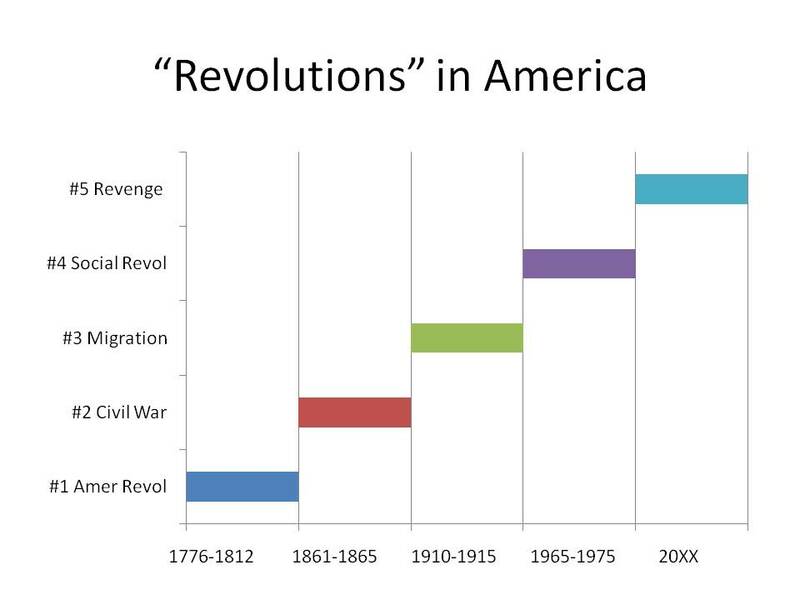 As the title of the blog notes, I believe the United States is headed for another revolution, probably by CY2020. As a country we seem to have a revolution about every 50 years. Here’s my count of the revolutions. Fifth revolution, which I have labeled the ‘Revenge Revolution,’ which is what this blog is all about. While I believe a revolution of sorts is inevitable, how we as a country manage the revolution will determine the amount of violence and bloodshed. I’ve designed the blog to lay out what I think are the issues, explain in what I hope are understandable terms, and then offer practical solutions. The solutions are woven into a story. We all seem to learn more effectively with stories. I hope you find these stories interesting and helpful in understanding topics and proposed solutions. Doubtless you will not agree with all the proposed solutions…but at least you will have been presented another perspective. Some of the stories seem more personal in nature and less about policy. I am including these segments because we are all products of our environment. We cannot divorce completely professional lives from our personal lives and background. If you have a political bent leaning strongly left or right, you’re likely to be disappointed in some of the proposed solutions. The goal is to present problems and solutions in an understandable way. Some solutions might lean more right; others might lean more left. I’m not keeping score about which side has more solutions. I hope you don’t try to keep score either. If you are a stickler for details, then read no farther. I’ve done my homework and the data are sound enough. If you want to nitpick, OK. But you’ll be missing the point. Listen to people making policy decisions in the United States. Whether voters or elected officials, few grasp the basics of an issue. The real world operates using less than perfect information. I also decided my character in the story should be an assumed name. Why? To provide more freedom to address issues without the reader immediately assuming some sort of bias on my part. The character name, “Jordan Abel” evolved one day. As far as the names and traits of the characters, like any author, I suppose, these are based in part on people one knows. If you are a friend and recognize yourself, don’t take the character too seriously. The topic is serious but using you as a base for the character was convenient. We all have quirks and it was much easier to write with someone in mind than to construct a character. Besides, even the seeming “bad guys” in this blog have some positive traits. Keep reading, you’ll turn out OK…and I will deny to everyone else that you are the model for the character. Where is this blog going? I don’t know. I intend to keep writing. National politics and personal issues provide an endless source of material. I also hope that my prediction about an armed revolution in the US is exaggerated. However, from everything that is happening in the US, I think a revolution is inevitable.